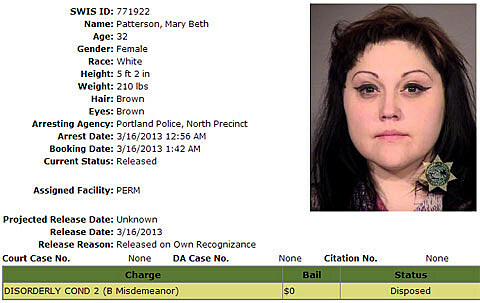 Gossip singer Beth Ditto was arrested and charged with disorderly conduct on Friday night (March 15). The singer was reportedly arrested at 1:42am after being denied service in the Bungalo Bar in Portland for being too drunk, you can see her police mug shot above. A source told Willamette Week that after being thrown out of the bar, Ditto “walked out in the middle of the street, threw off her shoes and purse and screamed ‘Obama! Obama! '” which alerted police who subsequently arrested her. We last caught Beth, in a much better mood, when she visited Brooklyn in September.